Riot Games held its annual League of Legend championships in South Korea, and it introduced a killer music video and concert that changed Egaming around the world. Not only was it a jaw-dropping performance, they showcased AR characters from League of Legends. Given ‘Kpop skins,’ Ahri, Akali, Evelynn and Kai’Sa became a four girl group comprised of stunning visuals, sickening dance moves and vocals provided by two members of the Kpop group (G)-I-DLE, Madison Beer and Jaira Burns. We will show you how to get the perfect wig so that you can be a member of this killer girl group. Imbued with magical energy, Ahri is a fox demon who can shape her magical energy into orbs and use it for battle. 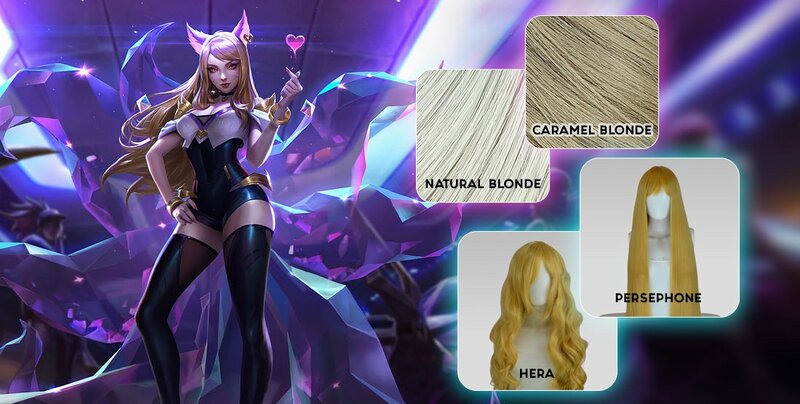 Ahri, being one of the most popular characters LOL has created, has multiple skins, including a kpop skin based off of Girls’ Generation. Caramel Blonde: If you're looking for something that's the most accurate to the official photo, then we believe Caramel Blonde is the best shade as it has a darker, yellow tone to it. Natural Blonde: Some will prefer a lighter shade, so Natural Blonde would be the next best color if Caramel Blonde is too dark for you. Persephone: The bangs are pretty spot-on and the overall length is about 40" long which is a great length for Ahri. Nyx: If 40" is too long for you and you want something easier to maintain, the Nyx style would be the next best choice as it is 28" long. Hera: If you want some wave to your wig then the Hera style would be fantastic pick! Known as the ‘The Rogue Assassin’ Akali strikes fear into her enemies as she slays the competition one by one. Pledging to protect Ionia from enemies, she attacks and kills with no hesitation. Dark Plum Purple: This color is definitely the perfect match for Akali. It has a reach deep plum color that works so well. Raspberry Pink Mix / Sky Magenta: If you're planning to cosplay her neon version, we suggest our brightest purple-pink tones: Sky Magenta and Raspberry Pink Mix! 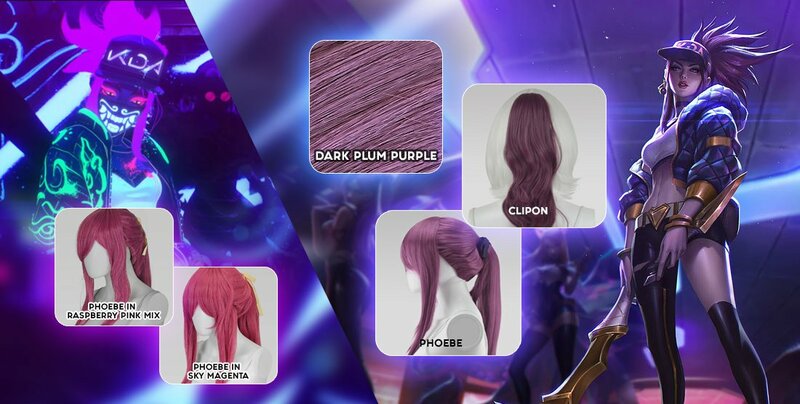 Phoebe: This prestyled ponytail wig already has a very similar silhouette to Akali's hairstyle so we think it would be a great fit! Ponytail Clipon: If you want extra volume, add an 18" ponytail clipon to the back of her wig! She is a demon with the power that no one wants to face, Evelynn is a champion that no one wants to fight. Using the form of a female, Evelynn attracts her victims with a false sense of security before revealing her true form. 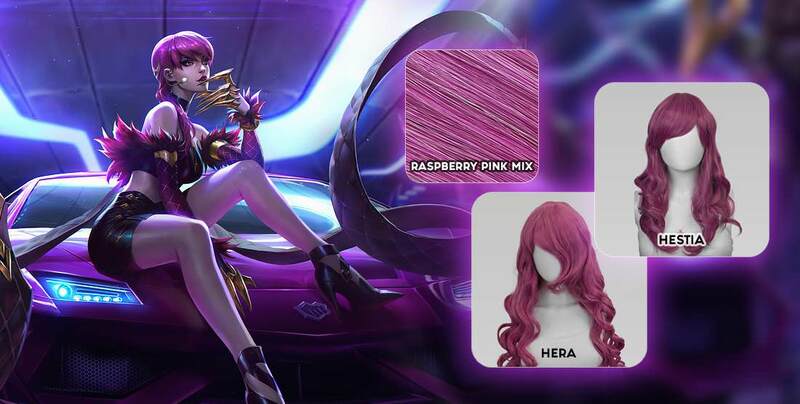 Raspberry Pink Mix: We can't think of any better color than Raspberry Pink Mix for Evelynn. While it may not be incredibly loud and bright as the model's original hair color, the Raspberry Pink Mix is a slightly toned down version of that which means it'll work with many different skin tones. Hestia: This is a great match for her hairstyle. It's got the right cut and length! Hera: Looking for something a bit longer? Hera would be the next best style to choose. She is the ‘Daughter of the Void.’ Claimed by the Void at a young age, Kai’Sa fought her way to become the warrior she is today. 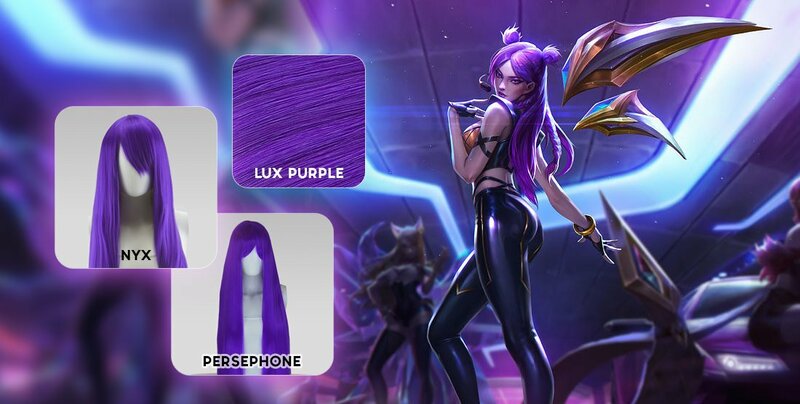 Lux Purple: This color is loud and vibrant which makes it the perfect shade for Kai'Sa. Nyx: This style is baaaasically identical to her hair style. Just grab a section of wig fibers to create the buns and you're gtg! Persephone: If you prefer something a bit longer then our 40" long Persephone wig would be the next best option. 15" Weft Extension: If you don't want to use the existing wig fibers from the base wig, we suggest getting a matching 15" Weft Extension pack to create the smol buns.